I had to relocated to this cabin from a higher elevation cabin due to snow forecast. The staff was great on meeting my request. Great cabin. And close to everything. Me and my wife stayed here for our one year anniversary. We did the express check in which made it super easy just to go strait to our cabin and get settled in after a long drive. When we arrived on Sunday evening the gas fireplace did not work, I called the office and someone was there within 30mins to look at it. He wasn't able to fix the problem, but had a tech there the next day and had it fixed. The cabin itself was smaller then we expected, but did not feel cramped at all and felt extremely comfortable. The driveway was a little tricky, but manageable. Enjoyed our stay very much and will likely stay again! We were a party of 4 adults. We really enjoyed the screened in back deck. We enjoyed the rocking chairs. We did not use the hot tub but it looked fine and we dipped our hand in it and it was nice and hot. The cabin is small and cozy. The drive is steep but not in bad condition although I am sure winter months would be harder. The kitchen is tiny but we were able to cook some meals with no trouble at all. Check in and out was a breeze. I have rented from Cabins USA many times over the years and I have honestly never had a problem. I trust my vacation to turn out fine when I use Cabins USA. Would stay here again and most definitely will use this company for my future rental needs. Bluff Haven is a very clean and comfortable cabin. Cabins USA was extremely pleasant to do business with. They were very prompt to resolve any issues. Our only complaint is the way the cabin is situated on the mountain, primarily the driveway to the cabin was very steep with two sharp turns to maneuver while on a steep uphill climb. We made it each day but every ascent and descent was made with anxious feelings and yes we are from flat land Louisiana. great cabin for our needs. four adults and two children had room to move and the porches were really nice. kitchen was a bit tight due to it also being an entry from the porch but overall- we enjoyed our stay. We have stayed with Cabin USA on several times in the last 3 years and have always had a great stay. I will continue to stay at Cabin USA in the future. But the Bluff Haven cabin we stayed in this time did have a few issues: The driveway to the cabin was very steep and my trailer hitch dragged on the driveway the first time I left, the microwave oven did not work properly and would only heat up the bottom of a sandwich, the couch was not comfortable for sitting and when you go to get up its hard to do because you are in a hole. Other than these items the rest of the stay was OK, but I will stay in the cabins that I have stayed in during recent rentals with Cabin USA. We loved staying in this cabin! Everything was very nice and clean and perfect for what we needed. I only have 2 complaints about this property. The first is that the door in the master bathroom that leads outside to the jacuzzi needs to have some kind of weather striping around it. We could see light around the edges of the door and because of that the bathroom was so cold. The second is that we were not warned (that I remember at least) that the cabin sits on a major hill. Normally this wouldn’t be a problem but because it was a little icy it made getting up the very steep driveway very hard sometimes. I would recommend 4 wheel drive for this property. The typed out directions that we were given at check in were perfect and spot on about where this cabin was located and how to get to it. We would definitely book again but maybe when it’s warmer. This cabin is cozy, yet the sofa in living room is a sleeper sofa with the mattress missing, therefore very hard to get up after sinking to the floor. The hot tub unfortunately was not clean and we couldn’t wouldn’t use it with brown chunks of something floating. One of the beds needs a major upgrade , the one on the left from entering. New mattress is a must on the cabins behalf , also the washer needed a couple of extra spins to be able to put clothes in dryer. We love going and this was the very first disappointment with Cabins USA. When my husband mentioned after our stay, I feel they should have given us a discount on next year, but to no avail. And I did personally have to clean the two toilets, other than that , we were pleased. The cabin was very nice. It was the driveway to the cabin that was the problem. Be aware that you have a steep driveway to the cabin driveway and then another steep drive to the cabin. If you don't have a big car or 4WD, then don't book this one. The cabin was comfortable and had all that you would need. The shower curtain in the one bathroom looked like it had mildew/mold on it. There was hair in the bathtub drain. Dishes in the dishwasher had not been all taken out. The dryer lint cleaner was full. Other than that, the place was very quaint and comfortable. I don't think I'd rent this one again because of the location of it, but all the cabins out that way in the mountains are going to be like that. Thank you for taking the time to let us know about your recent stay in Bluff Haven! 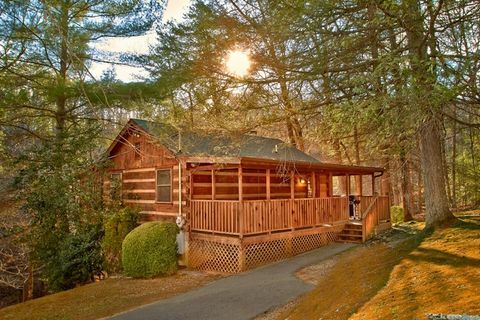 We here at Cabins USA strive to give each of our guests the best stay possible while vacationing in the Smokies. When you are ready to stay with us again, please mention you are a return guest for an additional discount. Thank you for choosing Cabins USA and we look forward to having you as our guest again soon! The only thing I was disappointed in was the hot tub. It looked dirty but I think it was just kind of water because I could smell the chlorine it just didn't look clean. Other than that everything was wonderful. Thank you for taking the time to let us know about your recent stay in Bluff Haven! We here at Cabins USA work hard to make sure each of our guests have the best stay possible while vacationing in the Smokies. I apologize for the issue you experienced with the fireplace. Your comments have been forwarded to our maintenance department to be addressed. When you are ready to stay with us again, please mention you are a return guest for an additional discount. Thank you again for your review and thank you for choosing Cabins USA! Need to mark driveway with address. No gas grill. Need to check dryer doesn't seem to be working properly. Overall enjoyed the cabin especially the peace and quiet. Looking forward to our next visit to the Great Smokey Mountains. The night we got there we called maintenance and they were supposed to fix the ice maker in the freezer and start the fireplace. No one ever showed up. The bedspread was ripped and the place could have been updated a little. It was hard to park because of steep hill. It was ok though we would probably do it again. Should be rated for sleeps 4 instead of 6. We had 2 kids and it was kind of tight with space. No grill on front porch like I saw in pictures. Needs 3 new mattresses. If you are staying more than one night bring your own towels unless you want to wash everyday. Beware dryer takes couple hours to dry them. Cabin was really clean and decorated nice on inside. Driveway very steep. Pool pass expired years ago. We just absolutely love our home away from home!!! We have stayed with Cabins USA a few times now & it has always been a very wonderful experience!!! From the express check in to the express check out, it really is the most speedy & convenient process!! The cabins are Always very clean & up to date!! We come every few months, so see ya soon!! Thx for a great mini vacation!! Thank you for continually choosing Cabins USA when you come to the Smokies! We make sure each of our guests have the same stay you enjoy when you stay with us. Thank you for all of your kind words and we look forward to having you as our guest again! Gas grill was listed on amenities and was not on property, the access is complicated. And hard to find with no proper direction. The hot tub was not working when we arrived and the entrance door was hard to open. We did enjoy our stay despite the couple of items mention. Thank you for taking the time to let us know about your recent stay in Bluff Haven. We here at Cabins USA work hard to make sure that each of our guests have a pleasant stay while vacationing in the Smokies. I apologize for the issue you experienced with the hot tub. Our maintenance department is working to correct that. When you are ready to stay with us again, please mention you are a return guest for an additional discount. Thank you for choosing Cabins USA and we look forward to having you as our guest again! We had a great time on our vacation ..my first vacation and it was so awesome thanks cabin usa.for everything ..even though a person may already be on vacation doesn't mean they automatically get relaxation .,but I can say everything was so comfortable which made it easier to relax and just have fun .cabin USA has everything u need and that's always a good deal. Thank you for choosing Cabins USA for your first vacation! We work hard to make sure that each of our guests have the same great stay you enjoyed while vacationing in the Smokies. When you are ready to stay with us again, please mention you are a return guest for an additional discount. Thank you again for choosing Cabins USA and we look forward to having you as our guest again! Picture of cabin is apparently old as surroundings and looks of the cabin have changed. Cabin was comfortable however. Drive way to cabin is steep and as stated in the instruction to the cabin, it is best to go past the driveway and turn around and approach from the opposite way. Again cabin was comfortable but weather was not good. Rained each day all day. Small and cozy, at the base of the mountain in a valley so not much of a view. Was smaller than expected but was fine for 4 people, can't imagine 6 unless it is one family but will probably feel cramped. Have booked through Cabins USA for several years now and have always enjoyed our stay, may find slightly bigger cabin next year though. Thank you for taking the time to let us know about your recent stay in Bluff Haven. We here at Cabins USA work hard to make sure that each of our guests have the same great stay you enjoyed while vacationing in the Smokies. Thank you again for your review and we look forward to seeing you again soon! I am so happy to hear that you enjoyed your stay in Bluff Haven! We would be more than happy to help you find a cabin for your anniversary trip next year. I will forward your information on to our reservations department and someone will be in contact with you soon. Thank you again for your review and we look forward to seeing you again soon! our second time in the hot tub. We couldn't get the toaster to work and the second bedroom bed was broken. Loved the view and listening to the birds and the traffic go by. This cabin was nice and was as expected. The driveway was quite steep and took a little getting used to, but we got used to it after a day or 2. The only thing that we could call an inconvenience was the slow draining master bath tub and sink...we let them know and they said it would be corrected. We have rented with Cabins USA before and were always pleased. We felt that the cabins were a good value and we would recommend the company. While this cabin was well equipped and comfortble, if we were to return in winter, we would probably choose a different cabin simply because of the challenging driveway. Overall, great experience and Cabins USA is recommended. We had a great time. Be careful in the winter because the property sits at the top of a very steep hill and can be kind of dicey. The cabin is super comfortable and we loved it! Awesome weekend get away. Lovely cabin. We got this cabin for our Honeymoon. It was as advertised.. Very close to all the places to see and not hard to find. The cabin itself is close to another cabin but still plenty of privacy because of how its placed on the property. Very comfortable and quiet stay and we really enjoyed it. The only reason I gave it a 9 on some ratings is because the gas grill was in pretty bad shape and probably should be replaced. It still works but it takes some effort. Overall though we were very pleased and will use CabinsUSA again in the future if we return to the area. Thank you for your review Chris. We are delighted you had a great honeymoon at Bluff Haven. We apologize if you were inconvenienced regarding the grill. We look into getting this replaced in the near future. We hope that we hear from you again.